Lock in a great price for Baan Sukreep Resort – rated 8.8 by recent guests! Clean, great staff, walking dostance to beach, the room had fresh flowers in it and elephants made feom towels. The owner and the staff are super nice and will try a full fill every need that you have, even the ones you didn't know you have. There is a magical jungly atmosphere. When you go out of the property you fill like you are in a small local village at least until you get to the main road, where you can find transportation without a problem. This place is amazing, we are more than happy with our choice! The owners are a very kind French couple and would advice you on everything you need regarding local entertainment and places to go! The atmosphere is nice, bungalows are clean and cozy, get cleaned every day. you literally live in the forest and enjoy the quietness and peace! You also can rent a scooter at the property! Stuff is friendly and responsive. Excellent choice in the price and quality ratio! Highly recommend!!!!! I spent quite a lot of time reading the reviews before booking and I must say everything positive I read was true: Bann Sukreep is a little Oasis of green and peace, our room felt very private, a few steps from the lovely swimming pool, the bed was very big and comfy with air con and ceiling fan, the staff very helpful and friendly and the nearest beach is a dream beach at just a 3min walk away. Very nice hotel with great and personal service. Cosy and comfortable, Bed, bath och AC were all very good. Cosy restaurant, good food och superfriendly staff. Close to the beach. Nice pool. We felt so welcome and when we asked for late check out - staff was so helpful and nice. Super service. Nice bungalows well equipped with touch of French sense for design. Great price/value ratio. We love it. Scooter rental in house and for reliable price. Everything was brilliant about the place. A real oasis. Baan Sukreep Resort This rating is a reflection of how the property compares to the industry standard when it comes to price, facilities and services available. It's based on a self-evaluation by the property. Use this rating to help choose your stay! 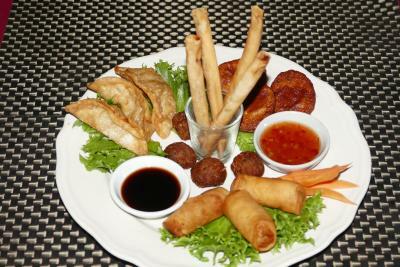 One of our best sellers in Chaweng Noi Beach! Set in tropical landscapes, Baan Sukreep Resort offers a peaceful retreat just a 5-minute walk away from Chaweng Noi Beach. It provides an outdoor pool and air-conditioned rooms with free Wi-Fi and a daily buffet breakfast. All rooms open out to a private balcony with pool or tropical views. Each room has a mini-bar, a safety deposit box, cable TV and a private bathroom. Baan Sukreep Resort is a 10-minute drive from shops at Chaweng’s lively center, and a 20-minute drive from Samui Airport. It provides chargeable airport transfers and free parking. Samui’s natural beauty can be easily explored with help from the tour desk or by renting a motorbike or car from the property. Added conveniences include daily housekeeping, laundry service and in-room massage. The poolside restaurant and lounge bar provides a relaxing setting for hearty Thai, Burmese and European meals and drinks. 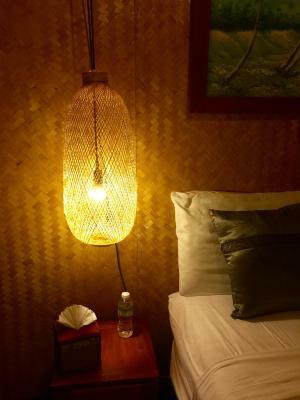 This is our guests' favorite part of Chaweng Noi Beach, according to independent reviews. This property is also rated for the best value in Chaweng Noi Beach! Guests are getting more for their money when compared to other properties in this city. 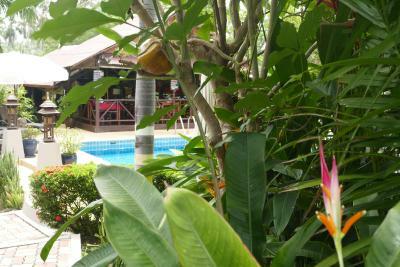 뀐 Located in the top-rated area in Chaweng Noi Beach, this property has an excellent location score of 8.2! 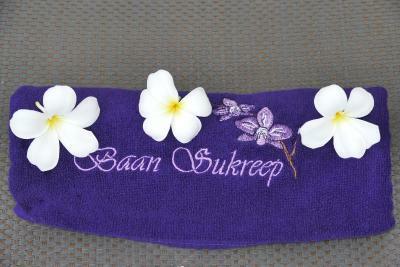 When would you like to stay at Baan Sukreep Resort? The traditional Thai-style bamboo bungalow comes with cable TV, air conditioning, safety deposit box, a mini-bar and a private balcony with garden or pool views. Please note that some bungalows cannot accommodate an extra bed. This air conditioned villa provides two bedrooms, one bathroom, a kitchenette, and a private terrace overlooking the tropical garden. It comes with a cable TV, safety deposit box and a mini-bar. An extra bed can be added on request at THB 500 to accommodate an extra person. 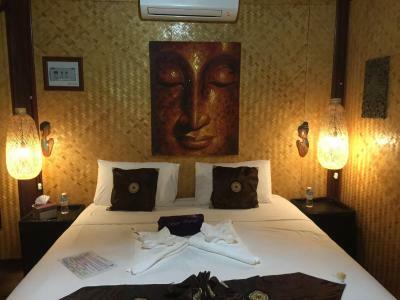 The Thai-style bamboo bungalow features one satellite TV, a safety deposit box and air conditioning per bedroom. 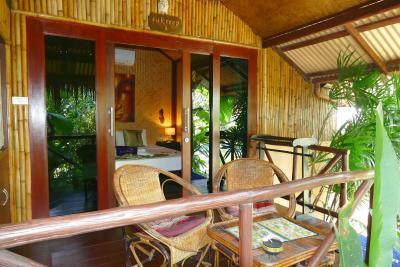 The bungalow also has one mini-bar and a hammock on the private terrace. An internal door connects the 2 rooms together. Offering a well-equipped terrace and garden views, this villa is appointed with a flat-screen cable TV, a safety deposit box and a mini-bar. It is composed of two bedrooms and one bathroom. This air-conditioned room features satellite TV, a safety deposit box and a mini-bar. The private bathroom comes with a shower. This air conditioned villa has a private terrace overlooking the garden and the swimming pool. It offers an outdoor living area. It is composed of two bedrooms and two private bathrooms. Composed of two bedrooms and two private bathrooms, the villa features air conditioning and a terrace that overlooks the garden. It offers an outdoor living area with a sofa. Amenities include a satellite TV, safety deposit box, mini-bar and air conditioning per bedroom. Nested in a wonderful zen tropical garden, we propose to our guests 6 traditionnal thaï style bamboo bungalows offering an original atmosphere with all the expected modern confort and 4 comfortable double-beds villas with an improved standing. You will relax at our Swimming Pool / Jacuzzi or lounge while enjoying delicious cocktails or fresh fruit shakes from our cocktail bar. Our family-run restaurant proposes delicious genuine thaï / european food and deserts to die for.... Ideally located, 5 min walk from one of the nicest beaches on the island, we are just in between the 2 major cities in the isaland: Chaweng and Lamai. We will pay a lot of attention to your expectations, and will be pleased to recommand the best adresses / must-see attractions in Koh Samui or the surrounding islands.. We also propose motorbike and car rental. Airport transport services can be proposed on request with a reasonable extra feee. House Rules Baan Sukreep Resort takes special requests – add in the next step! Please inform Baan Sukreep Resort of your expected arrival time in advance. You can use the Special Requests box when booking, or contact the property directly using the contact details in your confirmation. The accommodation was a little further from the beach than we appreciated from the advert and there were very few bars and restaurants within walking distance - although the few that were, were excellent. The Buffet Breakfast was the same everyday, with limited choice and annoyingly it required you to cook your own eggs whether boiled, fried or scrambled. Coffee and Tea were of the instant type again self made and from sachets and hot water. The staff were all extremely helpful and very friendly. The grounds of the facility although small were lovely as was the bar and restaurant. Crossing the busy street to go to beach. Loved the resort, the ambiance and pool. Not the best area to walk in - but only about 5-10 min walk to the beach. You do have to cross av very buisy road - but not a big problem. Taxi is easy to find. Unfortunately, our room which we have booked had short of electricity when every time we turn on the water heater. I hope it will be fixed when it's my next visit. It s location in the middle of everything yet far from the annoying mass tourism locations. You can really relax at the hotel. Chaweng beach is near (5 minutes on foot). Breakfast was nice and the owners Jean Luc and Odile with their recommendations and conversations make the added plus of this resort. Even the restaurant and cocktails at the resort are of good quality. The bed was lovely and comfy. The outside seating area outside our room like a oasis beautiful . The hosts were very friendly and helpful couldn't do enough for us even marked places to go and see of interest as we hired a scooter from them which was very good price and well maintained . Lovely pool also . All of the staff were also very nice .